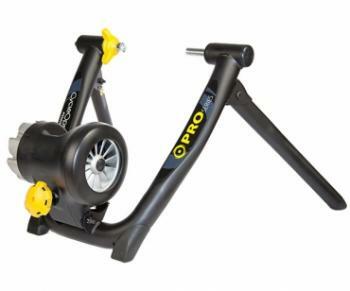 The CycleOps JetFluid Pro turbo trainer is a highly engineered trainer to bring as much realism to a trainer workout as possible. It is designed for the serious cyclist who is looking for an indoor experience that is as comparable to an outdoor experience as possible. It is also one of the quietest turbo trainers on the market. The JetFluid Pro uses CycleOps’ PowerTuned Technology that gives extremely realistic and smooth accelerations and inertial forces for all types of riders. 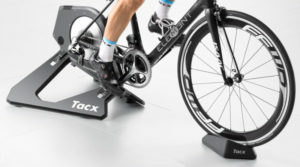 The trainer also has built in cooling systems to offer less heat generation within the turbo trainer, which means the physical properties of the fluid within the trainer (which offers the resistance) does not change and therefore the progressive power curve as you pedal remains consistent throughout your workout. The CycleOps JetFluid Pro uses a fluid brake, which provides a progressive resistance to your back wheel. This means the harder and faster you pedal the more resistance there is, and you can simply shift up the gears on your bike to add more resistance, just like on the open road. You therefore do not have different resistance levels to set like on other trainers (e.g. magnetic brakes). One drawback of this type of resistance brake is that you cannot simulate uphill climbs, but instead you workouts are more representative of flatter terrains. On the upside however is that the resistance increases on a smooth infinitely-increasing power curve so there are no sudden steps up in resistance as you pedal. The progressive resistance curve of the JetFluid Pro Trainer has been carefully engineered to be as realistic as possible compared to cycling on open roads, and PowerTuned flywheel creates high levels of inertia to compound this feeling. CycleOps also have a patented air intake on the fluid brake to cool the fluid as you workout, and their chamber and impeller allows for the optimum fluid distribution for a smooth and very quiet ride.